The telescope is undoubtedly one of the world’s most far-reaching inventions. For the past four centuries the telescope has stood at the forefront of human discovery. From its humble beginnings in seventeenth-century Holland, when a simple spectacle-maker first presented his invention to his country’s military leaders, to today’s colossal structures housed in space-age cathedrals, the telescope has unlocked nature’s secrets. And in the past decade, the Hubble Space Telescope has brought us to the very edges of the universe, and the very beginning of time. How did the telescope —a potent mix of art, science, and engineering—reach its present level of sophistication? The history of the telescope is a rich story of human ingenuity and perseverance involving some of the most colourful figures of the scientific world —Galileo, Johann Kepler, Isaac Newton, William Herschel, George Ellery Hale, and Edwin Hubble. 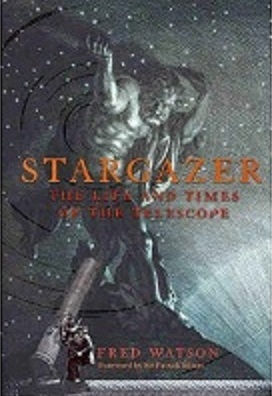 Stargazer brings to life the story of these brilliant, and sometime quirky, scientists as they turned their eyes and ideas beyond what anyone thought possible. Professor Fred Watson, one of Australia’s top astronomers, writes clearly and skilfully, without technical jargon but with a dash of humour, explaining the science and technology behind the telescope, and the enormous impact that it has had for four hundred years on how we have come to understand our universe.